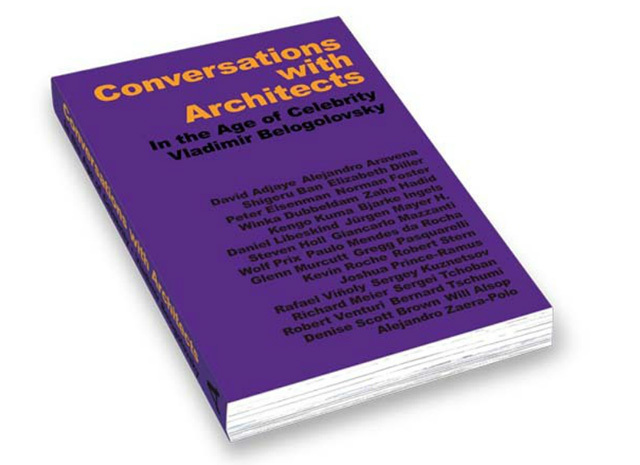 Curator and author Vladimir Belogolovsky did not set out to make a book on the celebrity phenomenon in architecture, as the name to this collection of 30 interviews with well known architects might indicate. Rather, as part of his work as a curator and a curiosity he partly attributes to the late John Hejduk, the conversations that took place starting in December 2002 were about various aspects of architecture and its profession, only occasionally about "starchitecture." Sure, the names are big ones, as evidenced by a quick glance at the cover, but this has more to do with particular projects, exhibitions, or other circumstances that led to the conversations, rather than Belogolovsky having sought out celebrity architects just for being such. Nevertheless, Belogolovsky does not shy away from the elephant in the room, since architects have to deal with the celebrity phenomenon just like any profession, and putting all these architects into one book would eventually lead to that theme coming to the fore. As Belogolovsky spells out in his introduction, he started interviewing architects when they gained the national and international spotlight thanks to the competition for the World Trade Center master plan in late 2002. In his mind, the publicity around the competition put architects and architecture in the public eye more than ever before. The book is then a way of exploring the theme of celebrity, at least inadvertently or from another angle, rather than head on. Whatever the case, the interviews are a delight to read, thanks to Belogolovsky's probing questions and his curiosity as to an architect's motives. The best conversations are the long ones where the architects are open and when the two are able to delve further into specific projects or ways of thinking. In addition to the interviews with architects, the book has conversations with Charles Jencks and Kenneth Frampton, both serving to provide context, like the author's introduction. Following the 30 interviews is a section with quotes by "missing architects," those who weren't interviewed or whose interviews didn't make it into the book (since 2002, Belogolovsky has interviewed over 100 architects). This short section – followed by a color page of magazines featuring architects on their covers, most of them non-trade magazines like Fast Company, Time, and Wired – extends the reach of the celebrity theme, as does the index, which includes other big-name architects who are mentioned in the interviews. Based on number of mentions in the index, the most popular celebrity architects are, in descending order, Zaha Hadid, Rem Koolhaas, Le Corbusier, Peter Eisenman, Frank Gehry, Daniel Libeskind, Mies van Der Rohe, and Frank Lloyd Wright. These names make clear that the celebrity phenomenon is not new, even though the prevalent digital and print media make it appear to be a contemporary creation.